LOS ANGELES, CALIFORNIA — 06/01/2017 — A North Hills man has been charged with murder following an alleged DUI head-on collision, killing a baby girl, the Los Angeles County District Attorney’s Office announced today. Julian Gutierrez (dob 7/31/91) faces one felony count each of murder, gross vehicular manslaughter while intoxicated, driving under the influence of alcohol causing injury within 10 years of two other DUI offenses and driving with a .08 percent blood alcohol content causing injury within 10 years of two other DUI offenses. Case LA086117 includes allegations that Gutierrez caused great bodily injury to the baby’s mother and he was convicted of misdemeanor DUIs in 2014, 2015 and 2016. The defendant pleaded not guilty to the charges yesterday and is scheduled to return on June 13 in Department 112 of the Los Angeles County Superior Court, Van Nuys Branch. 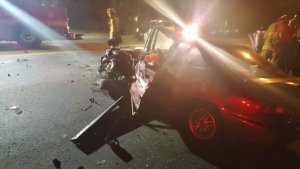 On May 26, Gutierrez was driving a 2010 Nissan Altima which allegedly veered into oncoming traffic near Fulton Avenue and Hatteras Street in Van Nuys, crashing head-on with a 1997 Acura Integra. The pregnant driver of the Integra was rushed to the hospital where her baby girl was born. The baby died soon after birth. Deputy District Attorney Sheetal Jhala is assigned to prosecute the case. Gutierrez is being held on $2 million bail. If convicted as charged, the defendant faces a possible maximum sentence of 25 years to life in state prison. The case remains under investigation by the Los Angeles Police Department, Valley Traffic Division. A 25-year-old man suspected of driving under the influence of alcohol or drugs and crashing head-on last week into a car whose pregnant driver gave birth to a baby girl who died has been booked on suspicion of murder, police said Wednesday. A 2010 Nissan Altima being driven south on Fulton Avenue, south of Hatteras Street, by Julian Gutierrez of North Hills crossed the double yellow lines and collided with a northbound 1997Acura Integra about 11:05 p.m. Friday, the Los Angeles Police Department reported. The driver of the Acura, Judith Mauricio, who was eight months pregnant, suffered serious injuries, police said. Mauricio was taken to a hospital, where she gave birth to a baby girl who subsequently died, police said. This entry was posted in Arrest bookings, DUI convictions, DWI arrest photos, DWI Arrests by State, DWI crash photos, injury or death, repeat offender and tagged $2 million bail., California Highway Patrol, Deputy District Attorney Sheetal Jhala, Driving Under the Influence, driving under the influence of alcohol, driving while impaired, driving while intoxicated, DUI, DWI, Judith Mauricio, Los Angeles County Superior Court, Los Angeles Police Department, two other DUI offenses. Bookmark the permalink.